Roosevelt was one of the towns that was settled leading up to the great 1902 rush to Thunder Mountain (read more about the rush here). 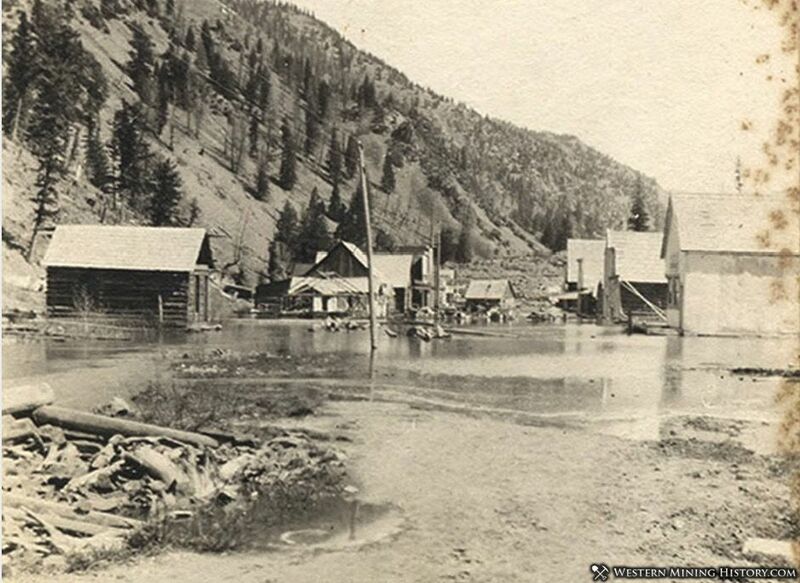 Roosevelt became the largest town in the district until 1909 when a mudslide dammed up the valley, causing the town to be submerged by the rising waters of Monumental creek, eventually forming what is known as Roosevelt Lake. 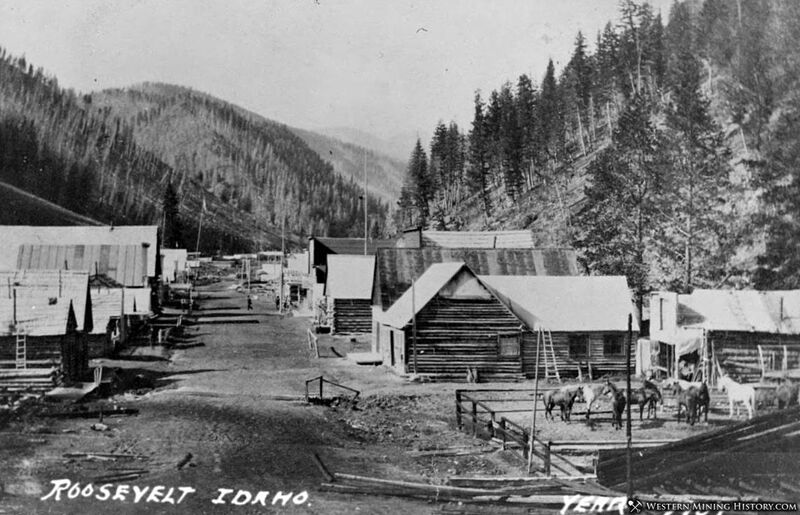 The town is situation on Monumental creek, and sandwiched between two mountains at an angle of forty-five degrees, and from 3,000 to 5,000 feet high. The creek flows from 600 to 700 inches of water at its lowest, and has a fall of from twenty-five to thirty feet to the mile. The townsite of Roosevelt is about one and a half miles long and from 150 to 300 feet wide. The land is about two feet above low water mark. The stream is noted for its changeable channels caused by snow slides and ice drifts that cause the water to back up until it rises from ten to fifteen feet in places, above the low water mark. From Mule up to Coney Creek, a distance of about 300 feet, the mountain sloping southeast has been swept of nearly all timber by snowslides which have taken rock and earth and deposited it in the bottom of the gulch where the townsite of Roosevelt is located. The snowslides and high water have destroyed all the timber on the creek bottom as far up as Taylor's cabin. On the northwest slope on the east side of Monumental creek the snowslides have not done so much damage, as the mountains are covered with a dense growth of heavy timber. But, if Roosevelt should make a town this timber will be used and then there will be no protection whatever against snowslides and the danger will be greater, and some day Roosevelt will be wiped from the face of the earth. This year is an exception, there being only from five to seven feet of snow, and the sun hardly ever touches the snow on this slope. If a man should build his house on stilts out of the way of high water, a snow slide is liable to come along and knock the props out from under him, and if he protects himself against snow slides the high water will drown him. . Despite the grim report by the Boise Clipper, Roosevelt did become the leading town in the district. A road reached the town in 1904 which greatly enhanced the town's standing. By the summer of 1902, Roosevelt had fourteen saloons, ten stores, two butcher shops, two drug stores, a restaurant, and a barbershop. During the first months of the rush, these businesses, along with a residential district, were housed in 42 tents and four log structures. All of the major mines in the district closed in 1908, so Roosevelt was already in serious decline when the catastrophe of 1909 struck. 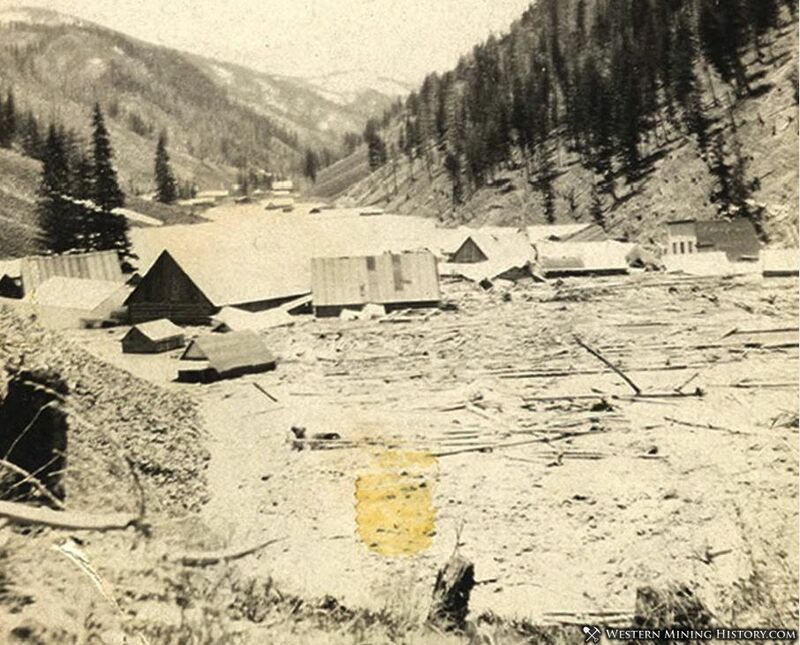 Before the seasonal population of miners had returned to the town in the spring of 1909, a major mudslide blocked Monumental creek, and the water began slowly filling the valley. This was a disaster in slow motion that nobody could stop. Over a period of months, the townsite of Roosevelt filled with water, submerging the town and creating what would be called Roosevelt lake. It is said that parts of buildings floated on the lake for decades, but little remains today.